How can postwar tower neighbourhoods, built 50 years ago, transition into more ecologically- and socially-sustainable places? As we look ahead to the next 50 years, how can we plan for more resilient relationships in the between our city and its remarkable ravine network? 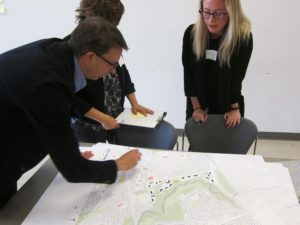 In May 2017, the Ontario Climate Consortium (including Toronto and Region Conservation and York University’s Faculty of Environmental Studies), the University of Toronto John H. Daniels Faculty of Architecture, Landscape and Design, Parallel 52, and the Centre for Urban Growth + Renewal partnered to co-host a student design charrette at the Ontario Climate Consortium (OCC) Symposium at York University. As our notions of city evolve to incorporate more responsive relationships to the natural environment, new urban forms and adaptive design processes will become increasingly important.  The charrette posed this problem to a group of students from five universities across Canada and the Netherlands. Graeme Stewart of CUG+R, alongside an esteemed panel of presenters from The Tower Neighbourhood Revitalization Unit at the City of Toronto Renewal Office (Toronto), the Toronto and Region Conservation Authority (TRCA), the Faculty of Architecture at Delft University of Technology, and the Sustainable Neighborhood Retrofit Action Plans (SNAP), were invited to discuss some of the issues faced by Canadian cities as they transition to more resilient urban modalities. The panelists provided insight into the initial 1960s ‘Tower on the Ravine’ planning rationale, and touched on the difficulties of reintegrating ravine systems into contemporary urban forms from legal, environmental, and social perspectives. Students were encouraged to understand both the historical context and the current conditions of their study site. 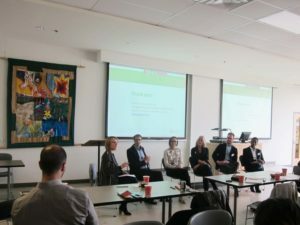 Panelists also discussed considerations around the design and implementation of meaningful community engagement programs, sharing case studies and success stories. Participants studied an apartment tower neighbourhood located in Toronto’s Rexdale area. The outcome was a range of exploratory models for the transformation of aging Modernist suburbs to low-carbon, socially-resilient urban forms. The winners of the Student Design Ideas competition were announced May 31st.